We had a sustainable transport evening at CUFOS on 14 June 2011 and the star attraction was the Spencer-Ivy electric bike that was displayed by its inventor Va Hua, who lives in Colney Hatch Lane. This is, in appearance, a conventional bike, not to be confused with the modish Boris Bike, and handles as such. But it also has a battery-powered booster that can be engaged to get you up steep hills. It made its debut in Muswell Hill last year when various model cyclists were being photographed for the website. The unofficial Marshal of our Low Carbon Zone, the Zone Ranger, was also in attendance; and he compared it favourably to a yearling quarter horse. One of the bikers at our meeting on 14 June was electric biker Emma Goold from St James’s Lane [Emma of the Five Hills] who rides her powered bike to work in Swiss Cottage every day. She says it is so much easier and cheaper than struggling there and back by car or public transport. 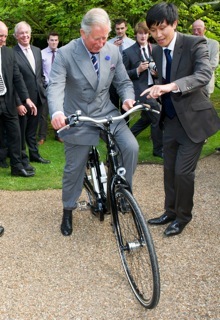 Regrettably HRH Prince Charles was unable to make our meeting on 14 June but Va Hua received an invitation to demonstrate the bike for him at Clarence House. As can be seen HRH found the steering tricky but provided a good opportunity for the photographers. On their website www.spencerivy.com he is titled The Prince of Wheels! The price? Think £2K (discounts for Royalty). I’ve been thinking that perhaps Muswell Hill, Highgate and Hampstead would all be great places to set-up an electric bike sharing club along the lines of what http://www.streetcar.co.uk/ do for cars? What do others think about this idea? Great post Jeremy. The transport evening was a great idea and it was a pleasure seeing so many people willing to get onto the saddle of an electric bike. We’ve just celebrated our first anniversary and are giving away an electric cycling holiday for two in the Brecon Beacons. More details here: http://www.spencerivy.com/blog. @Josef An electric bike sharing club would be ideal for the locations you mention and below are just a few of the ways people can benefit. Would be interesting to see what the MSHG thinks and if they could register people’s interest. Hi Spencer, just spotted your positive reply. I wonder if we could partners some how with http://a2b.ultramotor.com/en (arguably the best electric bikes and now available to hire from Hertz).